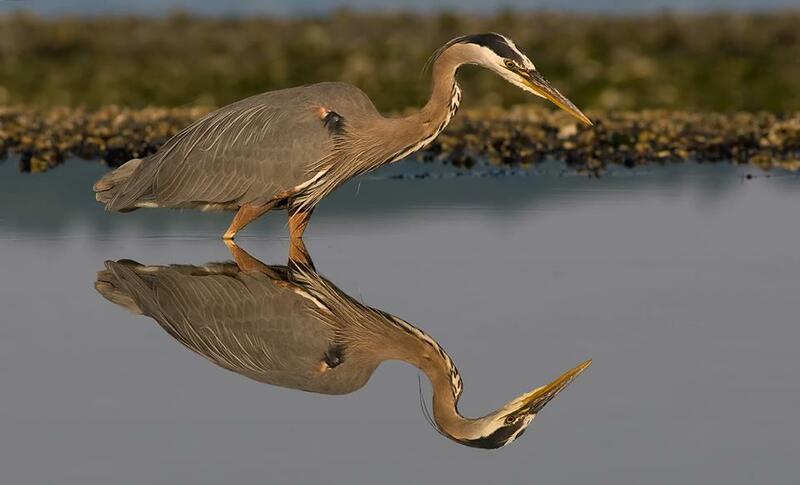 Tall and prehistoric-looking, the Great Blue Heron is the largest heron in North America. Great Blue Herons are often seen flying high overhead with slow wing-beats. When foraging, they stand silently along riverbanks, on lake shores, or in wet meadows. Quickly then, they stab at their prey. 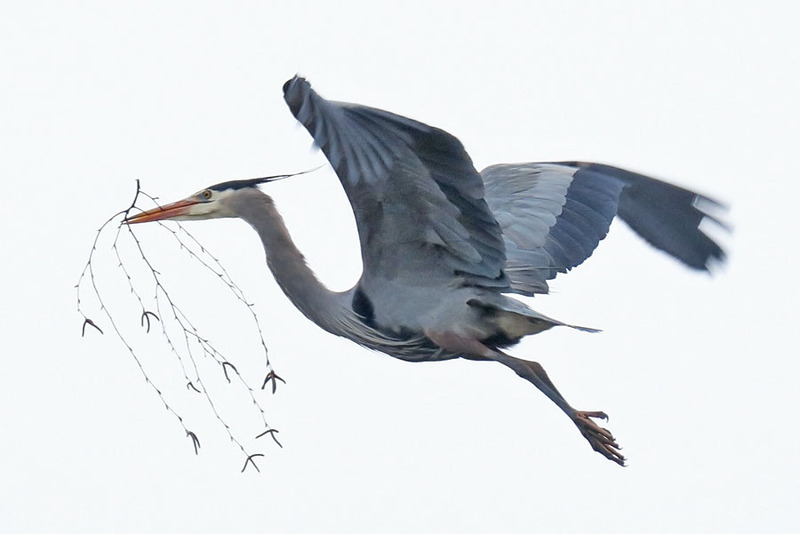 Although usually found in or near water, Great Blue Herons nest high in trees, with several nests in a colony. Learn more about this bird at Cornell's AllAboutBirds. 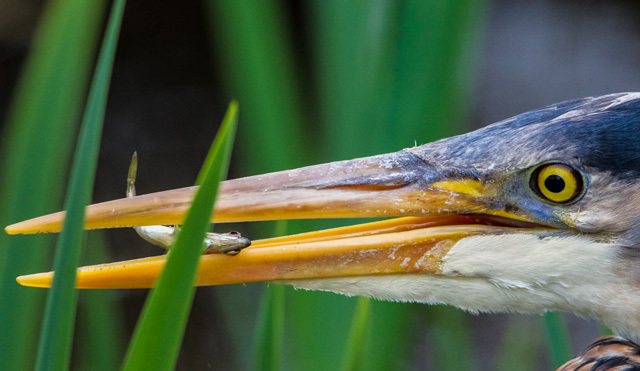 It may, but this sound comes from a present-day creature, the Great Blue Heron. 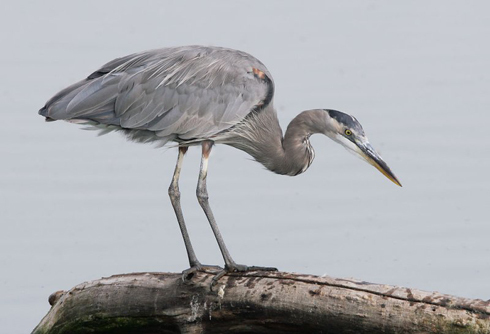 With long neck and legs, this blue-gray, crane-like bird is a familiar sight, standing sentinel on docks, hunkered in a field, or wading in shallow water. 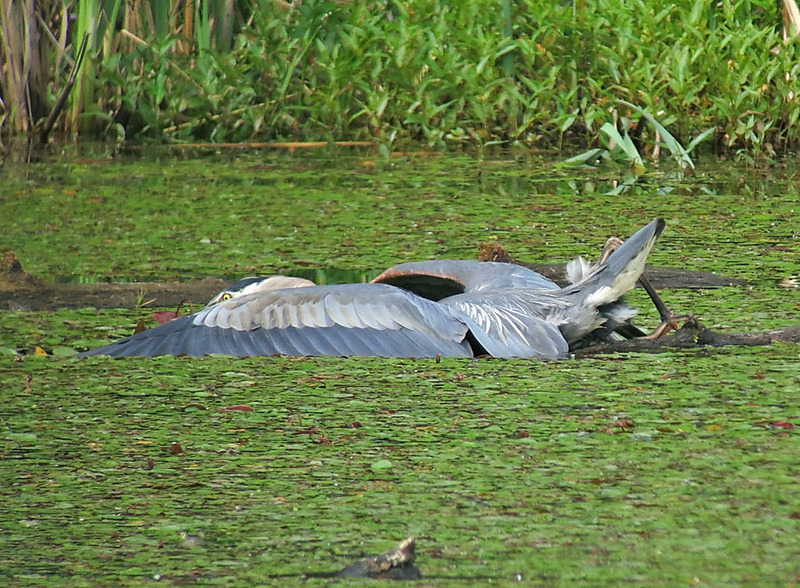 When feeding, the Great Blue Heron stands motionless in knee-deep water, watching for fish, its serpentine neck recoiled. Then, in a surge of power, the bird jabs its sharp bill into the water to spear a fish. If successful, the heron shuffles the fish into its beak and swallows it whole. Some Native American traditions hold that herons contain the souls of wise men who have returned to earth on mysterious pilgrimages. If true, these wise souls made a good choice: a magnificent bird with a quiet, reflective spirit, capable of waiting, watching, and seeing below the surface. Visit us on the web, at BirdNote.org. I'm Mary McCann. Call of the Great Blue Heron provided by: The Macaulay Library of Natural Sounds at the Cornell Lab of Ornithology, Ithaca, New York. Sound recordist: C.A. Sutherland, and with permission from the Peterson CD A Field Guide to Western Bird Songs.